Natasha Lewandrowski with Henry and his foster dad Root’n Toot’n. Photograph by Suzanne Shoemaker. 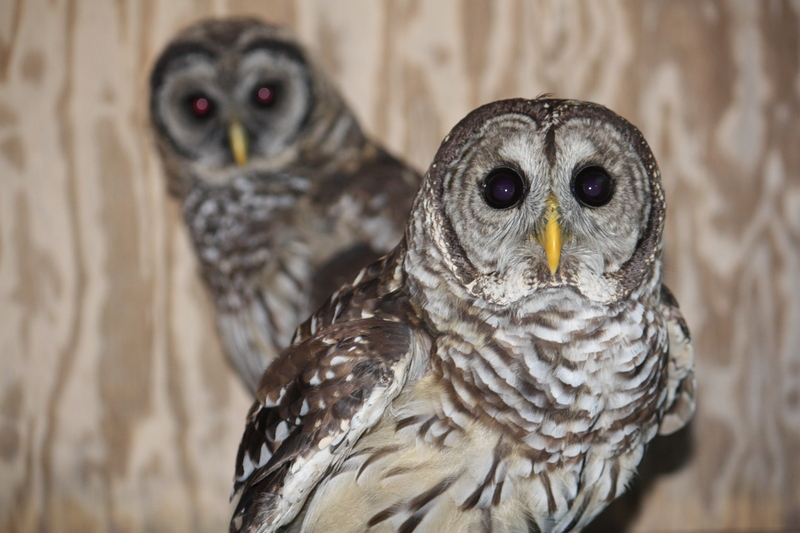 I am currently visiting my parents and Owl Moon Raptor Center at their home in Boyds. As some of you may know from my blog, I am in the process of moving from Seattle, WA, to New Brunswick, NJ with my husband, Dustin. We have been staying in Boyds for a few weeks while we search for a new apartment. Suzanne, my mother, wasted no time in putting me to work helping with the raptors. Since I have been here I have helped her administer medications and fluids to several patients, driven two birds to Tri-State Bird Rescue and Research Center in Newark, DE, and sewn protective mosquito-net curtains for the outdoor mews to keep the birds safe from West Nile Virus, not to mention writing this blog! West Nile Virus is spread through mosquito bites. 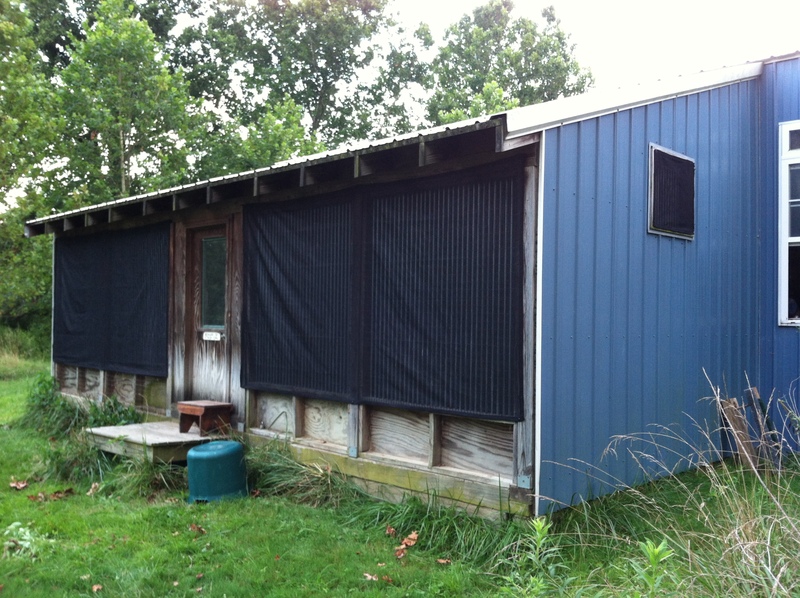 To protect the birds we covered the mew windows in mosquito netting. Photograph by Suzanne Shoemaker. One of the birds I drove to Tri-State was Sonya, the female Cooper’s hawk that was injured in a collision with a car back in February. Sonya has recovered from her injury, but she needs to show she is capable of catching live prey before she can be released. Sonya’s injury has permanently weakened her leg, so Suzanne canot fly her on the creance line for reconditioning. At Tri-State she will have the opportunity to prove her hunting proficiency while exercising in large outdoor flight cages. Zen (foreground) and Little Bear (background). Photograph by Suzanne Shoemaker. At Owl Moon there are seven patients presently on site. Zen the barred owl is still here. Pending a permit approval, Zen will be transferred to Meadowside Nature Center in Rockville, MD where he will be used for education. There is also a young barred owl we call Little Bear. Little Bear was found orphaned and emaciated. He is healthy now, but he will stay with us until he shows he is capable of hunting on his own, and then be released near where he was found in Pasadena, MD. 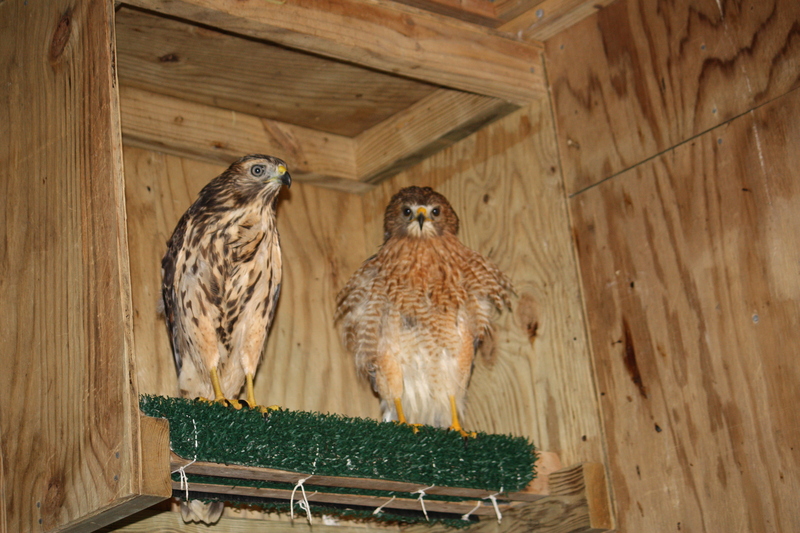 Crooked Beak (left) and Bob (right) are both red-shouldered hawks. They look different because Bob is an adult and Crooked Beak is a juvenile. When Crooked Beak gets older she too will gain the rust-red chest for which her species is named. Photograph by Suzanne Shoemaker. Bob, the red-shouldered hawk is re-growing some missing tail feathers. They have started to come in and we are hopeful he will soon be ready for release. In the meantime, he shares a mew with another red-shouldered hawk, Crooked Beak, a fledgling who was found with (you guessed it) a misaligned beak. Her beak is nearly in alignment now, but we cannot release her until we are sure that it will wear properly and not overgrow after she is released. Kite the fledgling osprey. Photograph by Suzanne Shoemaker. 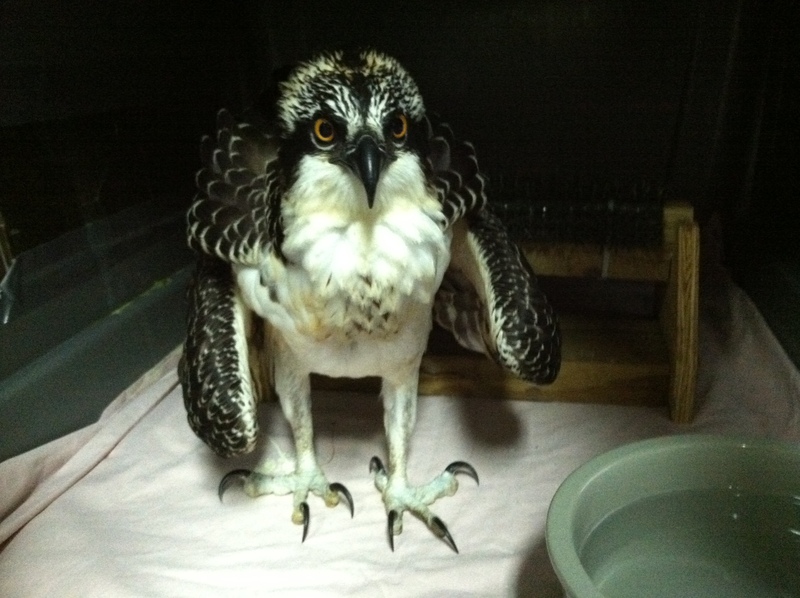 A fledgling osprey we named Kite arrived on July 20th. Kite was found struggling to free himself from fishing line caught on his toe, on a tree limb 50 feet off the ground. The most recent additions arrived yesterday, July 22. The first is a fledgling male red-shouldered hawk with symptoms of West Nile Virus. He is being treated with anti-inflammatory drugs and fluids. The other new arrival is a fledgling male Cooper’s hawk. He was injured when he flew into a window. Though he does not exhibit any external injuries, he is unable to stand. We will take him to the vet for X-rays on Wednesday. Root’n Toot’n (left) and Henry (right). Photograph by Suzanne Shoemaker. 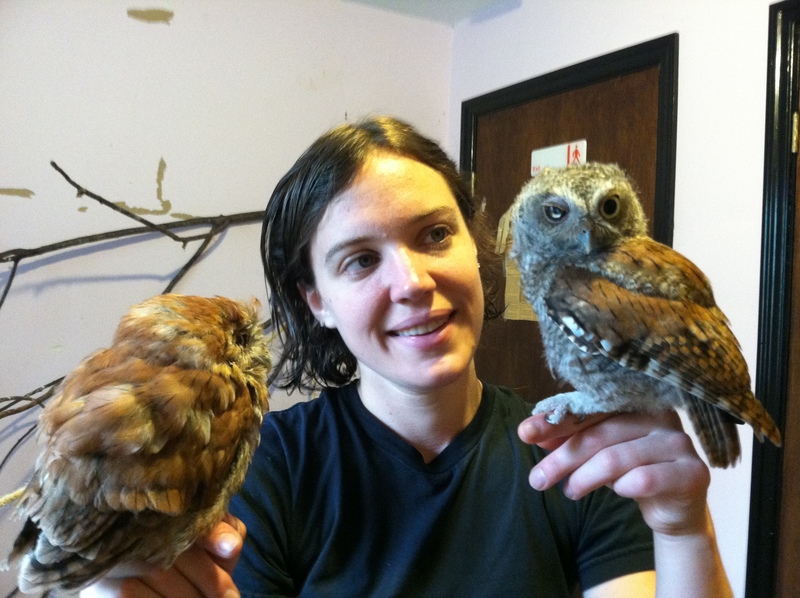 The most endearing patient is Henry, a fledgling screech owl. Henry came to Owl Moon on May 3rd after falling out of his nest cavity. He sustained an eye injury in the fall resulting in blindness in his right eye. His best chance to learn how to hunt would be with his parents, however, so Suzanne returned him to his nest. Unfortunately, she had to take him back when it seemed his parents had not returned to take care of him. Henry’s future is uncertain. If he shows he can hunt, he will be released. If not, he will be placed as an education bird. 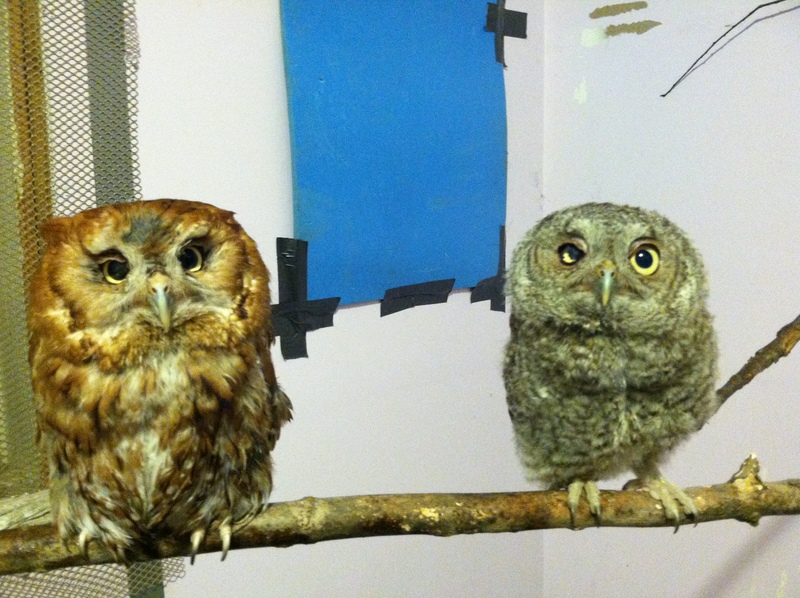 For now Henry is being fostered with an adult screech owl, Root’n Toot’n. While I hope Henry can be released, I know he would make an great education bird also. He has such an endearing personality. Check out these adorable videos of him! That brings us up to date on the current patients. We look forward to sharing many more stories of patients that have come and gone this busy nesting season in the near future! While staying with my parents at their house in Boyds I have been conscripted to help with Owl Moon, my mother’s raptor rehabilitation center. I cracked up watching “Henry is Unsure” and the other vids. Great headbob. Thanks for sharing! Awwww, great photos and I love the vids too! I hope he can learn to hunt successfully! Love the stories–keep it up! Thanks.